Will the letter from Bupati Rauf convince IFAD to fund Smart Tree-Invest for two more years? The District Government of Buol in Indonesia’s Central Sulawesi Province wants continued international support for a project under the CGIAR Research Program on Forests, Trees and Agroforestry, led by the World Agroforestry Centre (ICRAF) that helps with sustainable agricultural development based on agroforestry. ICRAF’s Rob Finlayson knows more about this success story. The popular Smart Tree-Invest (full name: Climate-smart, Tree-based, Co-investment in Adaptation and Mitigation in Asia) is an action-research project led by the World Agroforestry Centre (ICRAF). It has been operating at sites in Indonesia, Viet Nam and the Philippines since 2014 and is set to close next year. In Indonesia, the project’s site is in Buol, which is well-known as the biggest palm-oil producer in the province, with almost 10,000 hectares of primary and secondary forest lost to plantations between 1996 and 2014. The main objective of Smart Tree-Invest is to improve smallholders’ livelihoods through agroforestry, which maintains or improves environmental quality. To do so, the project is collaborating with many people in developing ‘co-investment for ecosystem services’ schemes, in which everyone involved in a landscape invests, bringing their resources together to improve the supply of ecosystem services, both natural and agricultural. In this final year, the team plans to increase their support to the government and smallholders, as requested by the district head, to replicate and widen ecosystem services schemes. 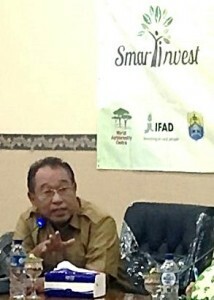 But it may not be the final year after all because, just now, the head of Buol District, Amiruddin Rauf, has written a formal request to the International Fund for Agricultural Development (IFAD) asking for the continuation of Smart Tree-Invest. In the letter, dated 23 May 2016, Rauf writes. As the Smart Tree-Invest project will terminate in March 2017, the District Government of Buol believes that the remaining period is too short to scale up the current activities and carry out collaboration with our existing programs in Buol. Therefore, we would like to request the addition of ICRAF and the Smart Tree-Invest project for another two years in Buol. There is now a moratorium on further oil-palm expansion and Rauf’s government had instigated both land-reform and poverty-alleviation-through-agriculture programs. Despite the success of these programs, the government wanted stronger scientific support, particularly, to evaluate the socio-economic and environmental impact. He urged the prolongation of Smart Tree-Invest beyond 2017 so that the government would have more time to synergize its work with the methodologies and findings of the project. 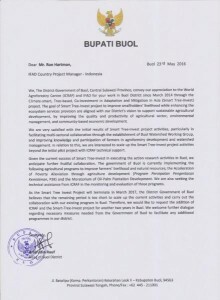 We are very satisfied with the initial results of Smart Tree-Invest project activities, particularly, in facilitating multi-sectoral collaboration through the establishment of the Buol Watershed Working Group and in improving knowledge and participation of farmers in agroforestry development and watershed management. In relation to this, we are interested to scale up the Smart Tree-Invest project activities beyond the initial pilot project, with ICRAF’s technical support. In the second year of Smart Tree-Invest, the project team worked with smallholders and the government to establish the watershed working group. The team also worked with smallholders’ groups to develop their own tree nurseries and monitor the condition of the watershed. The extension methods deployed included farm-management learning groups, which were established as a part of co-investment in ecosystem services. The decision to establish the learning groups and nurseries was based on the first year’s baseline study that showed a lack of management skills and agricultural knowledge increased smallholders’ vulnerability to changes in the environment, both natural and socio-economic. Both the government and the Smart Tree-Invest team are optimistic that the Fund will heed Rauf’s request and find ways to continue its effective support to the district.